A third of over 40s in Northamptonshire have not been offered a ‘health MOT’ in the past five years and hundreds of thousands of pounds given to the in crisis county council to spend on the vital check-up has not been spent. Only 66.7 per cent of those eligible for the important health check have been invited to have a check since 2013 and last year £277,000 of the £869,000 grant from Public Health England to Northants County Council to spend on the scheme was not spent. The authority is performing ‘significantly worse’ than the England average for its health check service. The news comes after it has been revealed that the county authority misspent £8m of its £35m grant awarded last year and now has been ordered by Public Health England to replenish the funds. It will be a tall order as the council is in the grip of a financial crisis and is struggling to keep afloat. Conservative councillor Jason Smithers, who represents the Rushden North and Higham Ferrers ward, said: “This is disgraceful. “If money is earmarked for public health then that is where it should be going. “What we need to find out is where that money has gone. “The director of public health Lucy Wightman will need to say something. “Big salaries come with big responsibilities. It is thought most of the £8m money spent wrongly went into propping up adult social care services. The free health check should be offered to everyone over 40 and should take place every five years until the age of 74. The 20-minute check aims to spot early signs of stroke, kidney disease, heart disease, type 2 diabetes or dementia. Northamptonshire County Council and its director of public health is responsible for commissioning the health checks and making sure they happen. Central government guidelines say that 100 per cent of those eligible should be checked. In Northamptonshire the scheme has been co-ordinated by the county council’s First for Wellbeing service which then commissions GP federations, who then typically sub contract to GP surgeries. Each health check costs £32. In 2017/18 15,648 of the 43,461 over 40s eligible in Northants were checked. This is 36 per cent of those entitled. A cabinet report discussed at One Angel Square last week (July 10) said: “Nationally available data for 2016/17 show that 66.7 per cent of Northamptonshire’s eligible population were offered a health check in the five-year period between 2013/14 and 2017/18. “This is significantly worse than the England average and is ranked 13th out of Northamptonshire’s 15 ‘nearest neighbours’, those local authorities that are statistically most similar to Northamptonshire. “However of those offered a check, 51.3 per cent received a health check, significantly more than the England average of 48.9 per cent and ranked 7th out of our nearest neighbours. A review into the service is now being carried out and a new five-year contract is soon to be procured and will come into place from April next year. 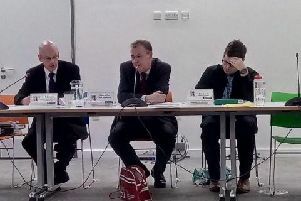 Liberal Democrat county councillor Chris Stanbra, who represents the Oakley ward in Corby, said there was a tendency at the county council to act as ‘the banker’ and hand out the money and then not take responsibility for the service. He said: “There is definitely an issue here. The annual health report for the county published earlier this month (July) painted a grim picture for Northamptonshire. There is a nine year life expectancy difference between men living in deprived areas of the county and those living in richer areas.